You are here: Home / Inframanage E-Learning / Infrastructure Asset Management e-Learning at Inframanage.com Available Now! Inframanage has started offering “e-Learning” for infrastructure asset management practitioners all over the world. 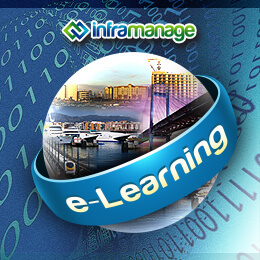 e-Learning is the website’s paid subscription section providing knowledge and skills on infrastructure asset management and related courses produced by the Inframanage.com team of experts. Led by Ross Waugh, Inframanage presents “Introduction to Practical Asset Management” as their initial video seminar offering to launch Inframanage e-Learning. In the video above, watch Ross Waugh enumerate the resources e-Learning subscribers will be able to access. Inframanage.com will be publishing out specific transferable infrastructure asset management learning on the items mentioned above.